A one-off copy of a Harry Potter spin-off book that was handwritten by JK Rowling has sold for almost £370,000. 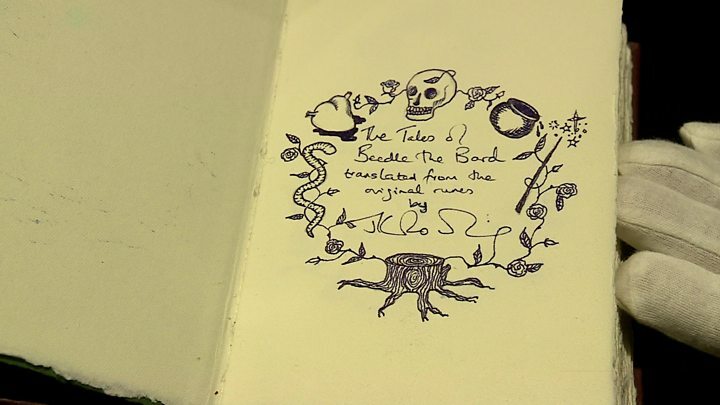 The bejewelled copy of The Tales of Beedle the Bard had been owned by Barry Cunningham, the publisher who first signed Rowling. It was one of six copies the author had given to people who were most closely involved in the Harry Potter books. Mr Cunningham has sold it with her blessing and said he will donate some of the profits to her charity Lumos. Mr Cunningham's copy went under the hammer at Sotheby's in London for £368,750, including buyer's premium. It had a pre-sale estimate of £300,000-£500,000. As well as writing the 6,000 words by hand, Rowling drew illustrations in the book and wrote an inscription to Mr Cunningham. She wrote: "To Barry, the man who thought an overlong novel about a boy wizard in glasses might just sell… THANK YOU." Mr Cunningham, who now runs his own publishing house, played an instrumental role in launching Rowling's career as an international best-selling author. The Tales of Beedle the Bard was originally released in 2007 as a spin-off from the main Harry Potter series. The book is bound in brown morocco leather and is adorned with semi-precious stones and a sterling silver mounted skull. The manuscript of the wizarding tales is one of only seven unique copies that exist. Six were given away by Rowling while a seventh was made specifically for sale at auction. It sold for £1.95m in 2007.